Time for where your staff marched previously pictures! And how about those lovely hairstyles? Somewhere in this picture from the 1982 Nighthawks, John Carollo is tossing guard equipment. 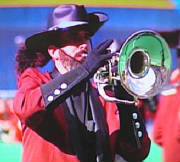 Denny Jones - Sky Ryders 1983 - DCI I&E "Pimpin Ain't Easy." 1988 Madison Scouts - Malaguena - Robert Poulin is the tenor player on the far right rocking out.